Michelle Interiors is a leading design firm with an impressive portfolio of residential projects throughout Chicago and its surrounding suburbs. In addition to working as a liaison between architects, builders and landscapers, Michelle's Interiors maintains strong partnerships with numerous trade partners and vendors. Known for its professionalism, integrity, quality designs and products, knowledgeable staff and superior customer service, Michelle’s Interiors is often the first place Chicagoland clients turn when they need an interior designer. Principal Michelle Rohrer-Lauer has more than 25 years of experience as a lead designer. Her small-yet-mighty firm comprises a senior designer, a project manager, a junior designer and a bookkeeper. Together, they provide “simply fabulous designs.” No matter the size or scope of the project at hand, Michelle’s Interiors delivers exactly what it promises, which allows for a painless and stress-free experience for each of its clients. Rohrer-Lauer and her staff address and resolve issues and concerns quickly and efficiently. Michelle’s Interiors will work with a client on an hourly or flat-fee basis, depending on the client’s preference and the scope of the project. No job is too small or too large, and if the client prefers a turnkey operation, the firm can do that, too. Michelle’s Interiors realizes that the interview process is essential to understanding how the clients want to live in their space. The best compliment the firm can receive is when a client says they’ve made their home their personal vacation destination. 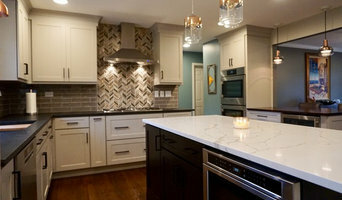 Michelle’s Interiors has earned several awards for its original furniture designs and solid surfacing techniques. Sought out for her advice on current designs and space-planning challenges, Rohrer-Lauer has appeared on HGTV, NBC, CBS, WGN and Martha Stewart Living Radio. She also contributed to the book “The Smart Approach to Kids’ Rooms.” In addition, her firm’s work has been featured in the “Chicago Sun-Times,” “Chicago Tribune,” “Daily Herald,” “Better Homes and Gardens,” and Better Homes and Garden’s “Bedroom and Bath” magazine. Michelle's Interiors cover the Metropolitan Chicago area plus second homes and vacation homes throughout the U.S. and beyond. Eclectic Design Source is an upscale, award winning residential & commercial interior design firm. We believe the key to great design is capturing the spirit of the client and the essence of their space. Yes, we have a store! Our retail boutique is located the heart of downtown Libertyville in the Historical Proctor Building. You’ll find plenty of fine home goods that can take your creativity to the next level. Maura Braun Interior Design, Inc. The essence of my design practice is simple: I strive to make your home an infinitely more beautiful place for you to live, and an infinitely more easy place in which to live, as well. In tandem, these two essentials—beauty and ease—allow life’s wonderful moments to unfold perfectly, and in ways you’ll not only cherish when you look back, but also fully enjoy while they’re happening. We design homes that let you relax during hectic periods while savoring the calm of quieter times. Entertaining friends, enjoying the comfort of a holiday meal, cozying up in front of a fireplace—we believe our homes are our sanctuaries and we design with that idea in the forefront of our minds. The surroundings we create are warm and welcoming, and we achieve this by bringing nature into the design of all our interiors. Color provides a warm base with which we blend all other materials. Selection of materials is focused on those that are created in nature, and bring about a textural experience unique only to your home. Together, color and materials provide the warmth and ease of living that we strive to provide for each client. Our philosophy is to help clients find inspriation and nurture their spaces into beautiful environments through thoughtful design. Whether choosing paint colors to enhance a room's presence to making construction selection choices from flooring, lighting, & layout and/or acquiring furniture, drapery, reapholstery services and accessories - we work with all of our clients on creating the environment that reflects their personality, taste and lifestyle. In addition to working with our clients on exploring various design options we work regularly as liasons with architects, contractors and vendors to ensure consistency and cooperation for a smooth and seamless project from start to finish. Our staging skills make it easy for us to transform spaces with existing pieces often revealing a fresh new look a client may not have been able to see on their own. We also work hard to find pieces, colors, textures, scale and interest when exploring a client's style and making sure we work with each client's budget. A good home design professional will hone your style down to its very essence and be able to choose a functional layout that feels natural to you. Interior design companies can be involved as much or as little as the client desires. Many clients who hire an interior decorator in Buffalo Grove, IL — particularly those who are remodeling — have a good sense of how the room should look and what products they should use. Often clients will insist that interior decorators use the products already present in the house. Other times a designer will need to start from scratch — especially if this is a newly purchased or just-built home. An interior design company will need to figure out exactly what the client needs, which includes organizing rooms, picking flooring and wall colors, and finding furniture to complement it all. Sometimes that means he or she will have to recruit help from other Buffalo Grove, IL home professionals to help create the perfect look for your renovation. Here are some related professionals and vendors to complement the work of interior designers & decorators: Architects & Building Designers, General Contractors, Home Builders, Design-Build Firms, Photographers. Do your research before meeting with an interior designer or home decorator in Buffalo Grove, IL. Ask yourself what you want your space to become and what it will be used for. Figure out the extent of what you need help with, what your must-haves are and what your budget is. Interior design services can add up fast, so be up front with a potential design firm or individual from the beginning. Also, pick an interior decorator that fits your style. Browse through the portfolios of different Buffalo Grove interior design firms and decide if you would live in those houses. Just because you like something doesn’t mean you could live in it. There's a big difference! Find an interior designer or home decorator in Buffalo Grove, IL on Houzz. Narrow your search in the Professionals section to find Buffalo Grove interior designers near you. You can also look through Buffalo Grove, IL photos to find a room you like, then contact the design firm who designed it.